The chart shows the number of mobile phones and landlines per 100 people in selected countries. The given illustration gives data on the number of mobiles and land phone users in six different countries namely: Canada, US, Germany, Denmark, the UK, Sweden, and Italy. 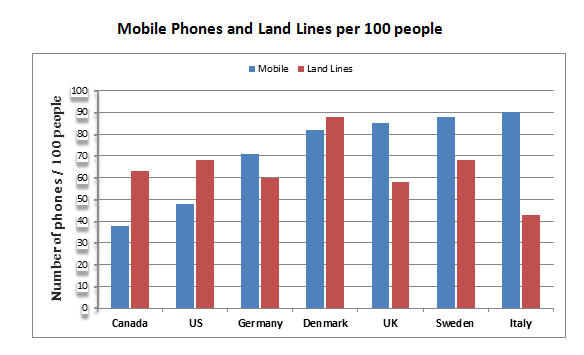 As is presented in the chart, Canada, US and Denmark have more landline users than the cell phone users while the opposite is true for Germany, UK, Sweden and Italy where the cell phone users exceed the number of land phone users. In Canada, the US and Denmark the numbers of cell phone users per 100 are consecutively 38, 48 and 71 while the landline users are 61, 38 and 87. On the other hand, the remaining 4 countries have much more mobile phone users than landline users. This translation is from Laokaoya website. The Italian people use the highest percentage of land phones and lowest percentage of cell phones on an average. On the contrary, Canadians use the lowest number of cell phones per 100 people while the mobiles phone users are almost half of the total land phone users. In summary, the US and Canada have higher land phone users than cell phone users while the European prefers to use cell phones than land phones.